As part of their mission to revolutionize the game, adidas has released what is the most competitive laceless boot ever to hit the market. The Ace16+ PURECONTROL is a boot that relies on compression knit to keep your feet locked down through wear. The idea of boots without laces is not something new, but putting it into practice and ensuring it has universal coverage among different types of players is where the real challenge lies. As you’d expect there are a lot of questions to be covered with the overall fit and performance of such a radical design, so we’ve grabbed a pair in the release Solar Green colorway, and taken them through their paces to fill in the gaps players need answered. Like most players, my initial thoughts went directly toward fit and how such a design would feel to wear in game. 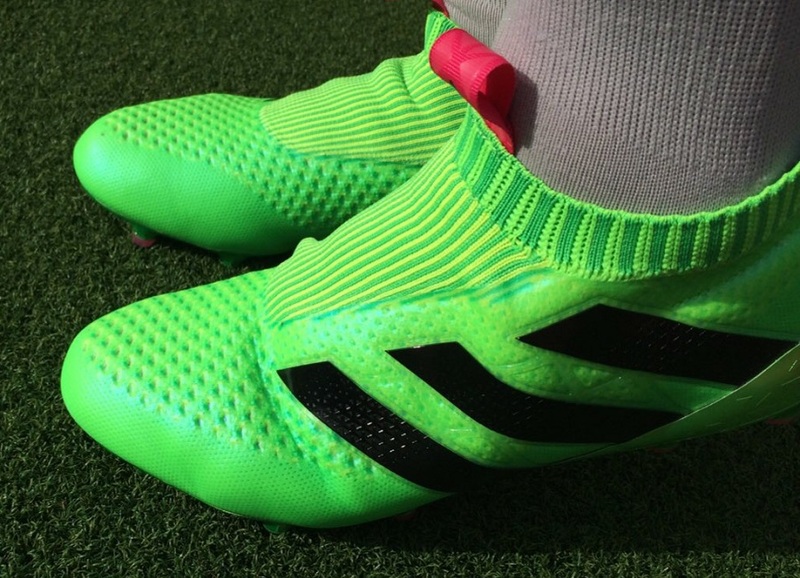 Would they stay on through sharp cuts and dynamic turns, or would your game be negatively affected by unusual foot movements? Using knit makes a lot of sense when it comes to going laceless, and having experienced other boots with internal style knit systems, the opportunity is their to perfect a new type of playing technology. Being that it is one of the most important aspects of the boot, I figured we should tackle it first. For testing, I wore a size 9US, which is my normal boot size. I can confirm that length wise, they are a pretty form fitting true-to-size option. Because you are relying on compression to secure your foot down, the overall structure of the boot needs to be tight, for some that might produce an uncomfortable sensation. But in my experience, they offer just enough room up around the toes to leave you sitting snug without forcing pressure as your make sharp cuts where your foot shifts toward the front of the boot. Width wise, they are an adequate medium/wide fitting boot. 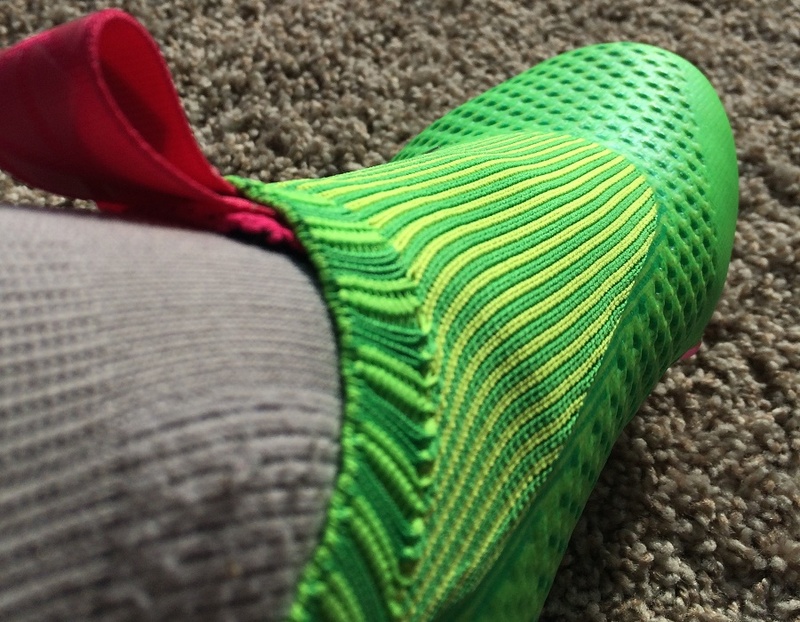 You might expect a boot like this will stretch over time, considering Primeknit is used through the upper. But I’m going to literally shoot your expectations in the foot right now! 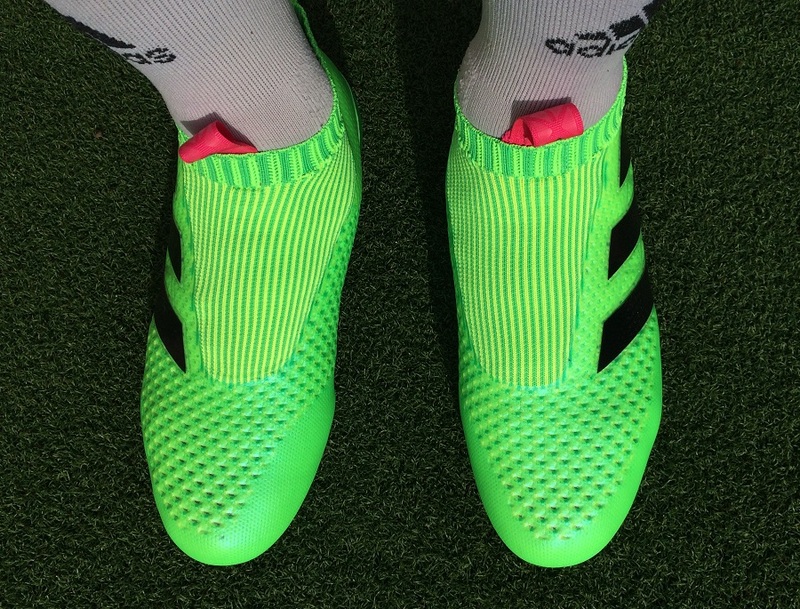 Across the upper, adidas employ a layer of synthetic that is intended to hold the structure of the boot in place, and it reduces the opportunity for stretch. Basically, how they feel when you put them on is how they should feel after extended wear. And unlike a boot that features laces, you can’t loosen them up by opening the laces out. A primary concern with a boot like this is that the loose upper will allow for an increased ankle movement and potential for injury. In play, the walls of the upper are as strong as you’d expect, plus the higher cut ankle line adds a little extra support. So, from my experience you won’t need to worry too much unless the surface is extremely chopped up. Are they worth going up a half size in? For some players, the answer will be yes. But the end result is a boot that is unlikely to fit in other areas. If sizing is a concern, play it safe and stick with Ace16.1 Primeknit instead. Here lies what will be your toughest challenge with PURECONTROL. They are actually pretty tough to get your feet into, something that is intended in order to create optimal fit. In order to help you out, there are two pull tabs around the ankle opening. One sits on the heel, the other sits on the front ankle opening. You are going to use both in order to get your foot in – trust me! After some wiggle and angled foot movements, I managed to get my feet in. If those tabs ever rip or tear off, I’ve no idea how I’ll get my feet back in to them again. Adidas do include a shoehorn in the box to help get the boots off, you basically force it in behind your heel and use it to cup/pry your foot out of the boot. It works very effectively! If you’ve managed to figure out the right size, you shouldn’t experience too much in the way of comfort issues. I’ve actually found that they provide a very comfortable fit, thanks in part to the lockdown internal knit cage. It offers a very snug feel through the midfoot without being overly restrictive, something that did cause some nervousness before I wore them. I’ve never been a real fan of relying on internal cage systems in any boot to provide a proficient locked down fit. But in this case, adidas has balanced everything real well and you do get a secure feel as you wear them. This seems like the right time to also point out a more rounded and slightly deeper heel cup that is used. 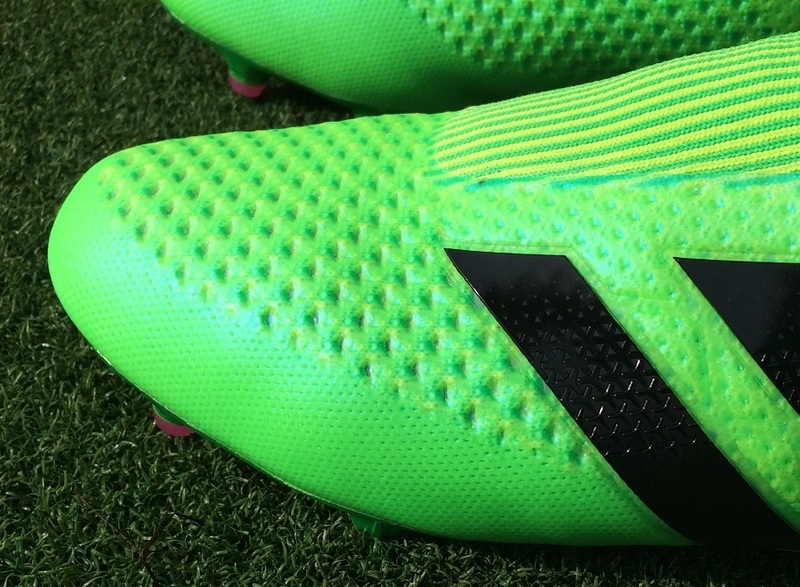 It is also employed in the Ace16+ Primeknit, but you can tell there is a difference, with more of a hollowness through the base of the PURECONTROL. Does it create a negative fit through the area? Towards the end of wearing them for the first time, I felt slightly raw on the tip of my heel. I was able to continue and it isn’t something that caused any performance issues. The material does sit closer along your Achilles, but it doesn’t add any unnecessary or unexpected pressure. Through their release phase, many have been quick to point out that the Lotto Zhero Gravity series featured the first laceless boot design. That might be true, but there is a huge difference in the performance characteristics of both boots. 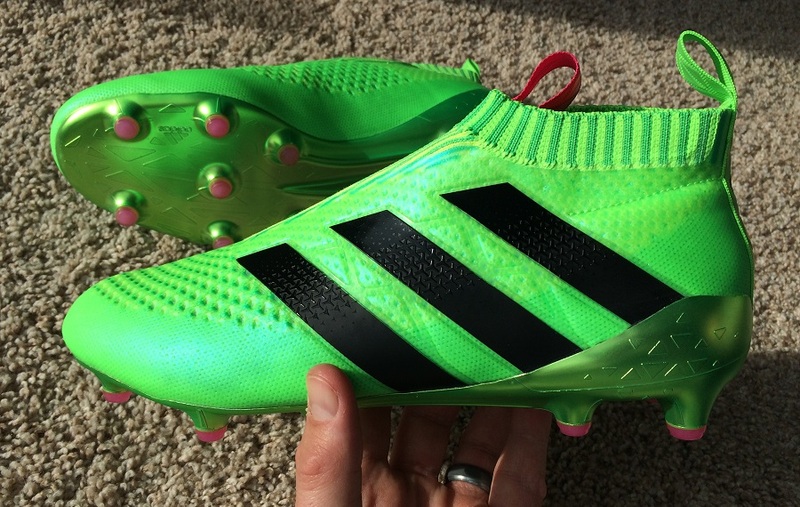 Any comments about adidas “copying” Lotto are ridiculous and based on a lack of knowledge. The fact no other brand took the steps to create such a radical design in an example of adidas’ desire to change the game. The upper of the Zhero Gravity was a thick synthetic, with a rubber compound used around the ankle lining to keep your foot locked in. The result was a very uncomfortable boot that really didn’t fit that well. In comparison, the PURECONTROL features a knit upper that is much softer, a lot more comfortable and designed to accommodate a much broader range of players. They target a similar type of technology, but in vastly different ways! How Are They For Striking Shots? First to note here is that the upper material is pretty pliable, so it provides a little extra protection and a durable feel. Adidas adds what feels like a layer of microfiber over the knit to create structure and shape. Its role, in that respect, is extremely important. To enhance performance, the material has been punched (almost perforated) through the forefoot and strikezone. It is an unusual design, with plenty of deep definition in areas that contact the ball most often. We have seen many brands raise the upper structure to increase surface contact, but here adidas are use a deeper design to impact ball control. And it does play its part in feel on the ball. Without having a grip upper texture, you do get a sense of security as you cushion passes and dish out through balls. Striking shots is a little more interesting, primarily because the strike zone consists of half microfiber and half knit material, the latter being the area where the laces are replaced. If that knit was the primary area alone contacting the boot, you’d feel the impact. But, underneath you get the knit cage system. Together, they create a surprisingly deep cushion feel that has a slight spring-back feel. This helps soak in impact and provides solid feel as you strike shots. This was one of the more surprising aspects I encountered with the boots! In order for the fit to really work, adidas use an internal knit cage. This is basically a build in piece of knit material that runs across your midfoot region. It is held in place via some stitching on the front top of the knit collar, along with the red pull tab. It has a tighter fit than the actual upper of the boot, so its purpose is to gently hug the contours of your midfoot, something it does very well without being overly constrictive. It also sits very flush with the arch, so there is some additional support provided in the area. 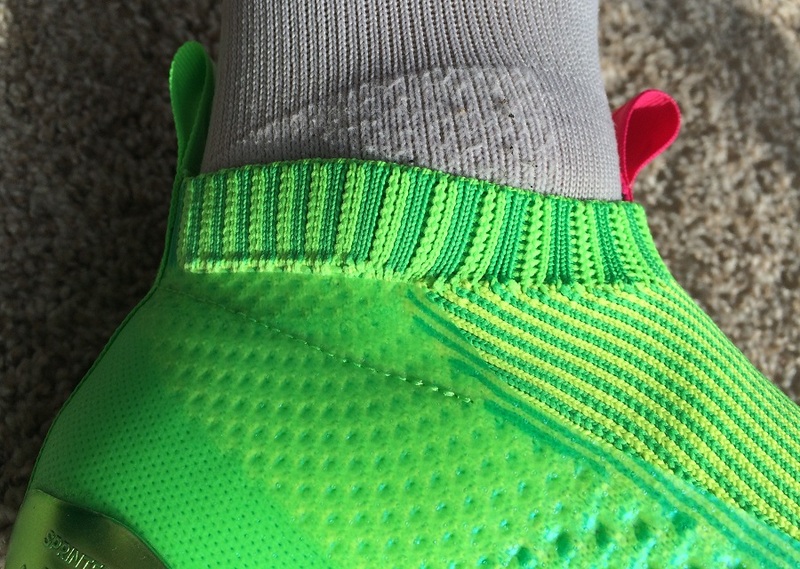 This simple piece of material is the key to the laceless design. Without it, they would be loose on foot and provide a fit similar to what you’d get while wearing Nike’s Magista Obra without laces. Adidas has returned to a SprintFrame, and that is probably one of the more surprising aspects of this release! You might remember the SprintFrame as being the soleplate of choice for the adiZero series. The difference on this version is a switch to conical studs, something that allows adidas to continue referencing to them as an AG option. Yes, these boots are again labeled for use on both FG/AG. You might recall the Ace15.1 featured a soleplate with multiple nubs through the main conical studs, improving overall grip and traction on the surface. Why adidas has took this new route is an unknown, but our guess is that it decreased the overall weight of the boot, something adidas was obviously focused on achieving. This is a first edition laceless release, so I can definitely see some areas where adidas can create even better. Feedback from players will provide relevant details on how internal fit can be adjusted, and I can definitely see changes to the upper material to make it more pliable without losing structure. Outside of those comments, there is nothing negative to report about these boots. If you want to experience laceless, this is the only true option that you have to choose from! Highlight: The first fully functional laceless boot, designed using Primeknit materials, and designed with durability in mind. 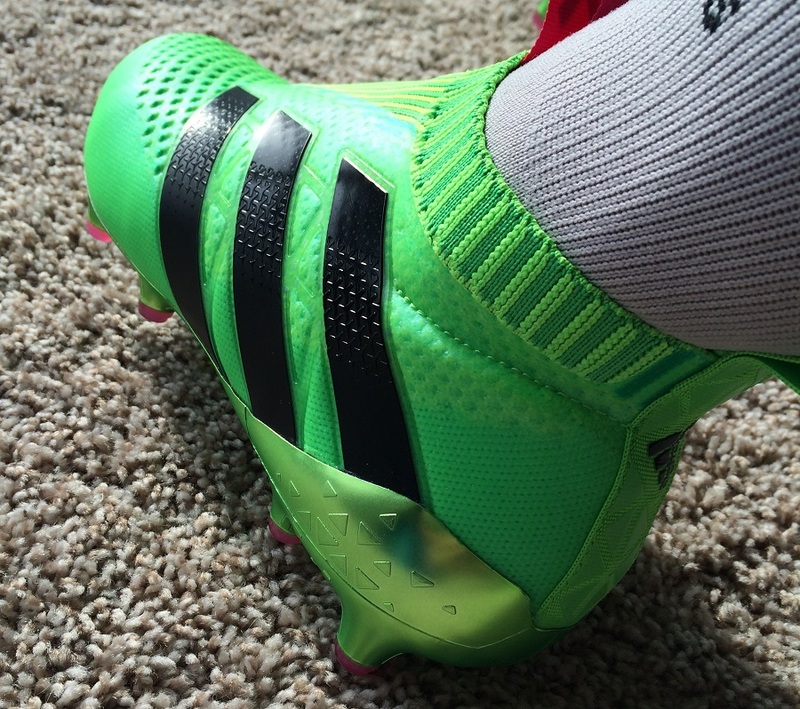 Category: Designed to a Control boot, ideal for playmakers. Would I Buy Them: They provide players with a completely new type of technology and they perform like a top range boot. 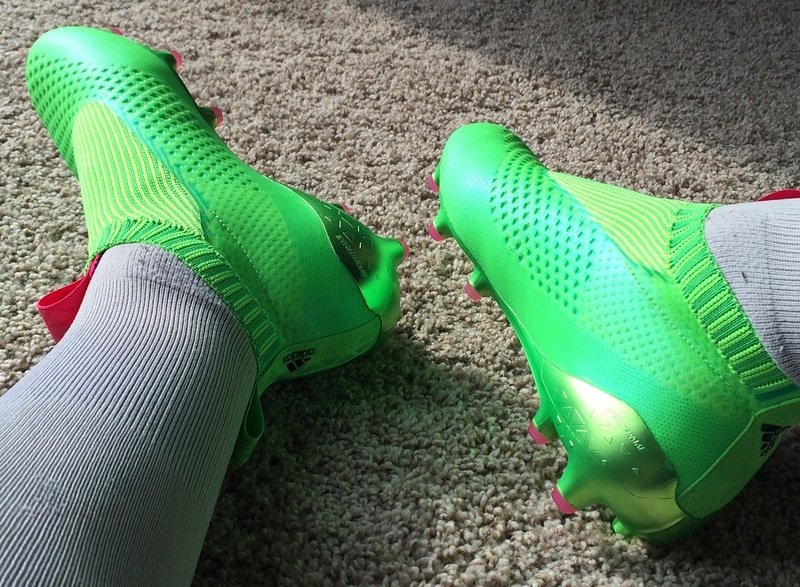 It comes down to whether players want what they have on offer – no laces! Player Position: The players advertised wearing them through release are all attack minded players, positioned in a midfield tole. Mesut Ozil and Ivan Rakitic being two prime examples. They have a diverse functionality, but I see players in the mold of the aforementioned making the most out of them! Although the fit is important, there are only five sentences about how they perform on the ball and how they work during play. Bryan, if I'm going to drop 300 bucks, I'm gonna need a little more here! There are several different areas that cover performance, right through the review. If you have any specific questions, feel free to leave them here and I'll share additional insight! Would using them with trusox socks help with the grip of the foot inside? Wouldn't hurt to have that extra level of grip! Sorry Bryan but did you write this article? If so, there a couple of points that far from being correct. 1) Why struggle with only the pull tabs when you can easily use the shoe horn that comes in the box? 2) There is not a single piece of microfiber on this boot. A microfiber is the synthetic material with the fluffy backside to mimic leather. This has the vacuum silicon skin on top like all other Primeknit models. 1) Using the shoehorn only helps getting your feet out of the boots. Using it to get your feet into an already crowded space is uncomfortable. Taking them out it helps cup your heel and wedge it out. 2) Yes, your correct about the top layer being a vacuum skin. But, it is far thicker than the same material found on Primeknit 15.1. Here it is several layers thicker and I'm not convinced it is just a single vacuum layer. is it true they make your heels hurt after a full 90 min game. does that go away after breaking them in? So if im a size 9 would you prefer a 9 or 9.5? I'd stick with 9US, 9.5US if you appreciate a little extra breathing room through play. Would these fit the same length wise at the prime knit 16.1? No because of the laceless primeknit upper which is slightly different to them. So I bought a pair of these a few weeks ago and the sole is already coming away from the upper at the front. Is anyone else having this issue? Also, do not think you need a bigger size because there are no laces, if you're a size 9 get a size 9, I made the mistake of buying half a size too big. All good feedback. Sorry to hear about the separation, I'd definitely return them if it has only been a month.